E! News just shared an exclusive deleted scene from Love, Simon. 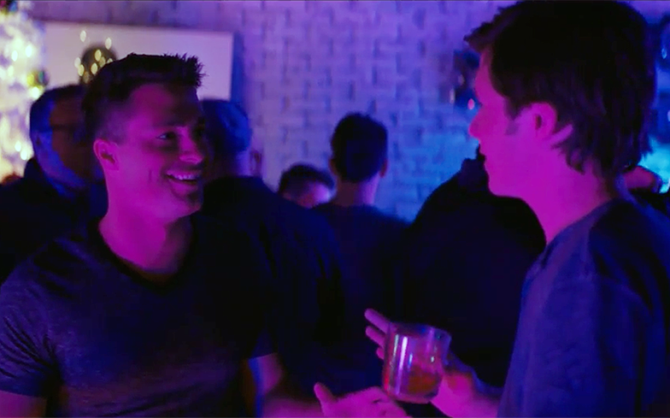 In the scene, Simon sneaks into his first gay bar with his straight wingman Nick. Ironically, Nick seems more comfortable at the bar than Simon. “I think that guy is checking me out,” he says. Moments later, a cute college co-ed named Kevin (played by Haynes) approaches. He asks Simon if he’d like to dance. Simon awkwardly says no—but Nick insists he not pass up the opportunity. Love, Simon is available on Digital today. The DVD/Blu-ray will be released June 12. It is a good scene and I think would have been great in the movie. Unfortunately, it shows again shows Simon (Nick Robinson) can’t dance. The “being gay in college” scene showed his lack of ability more clearly. Would have been better to cut that scene than this one. Kid dancing like the straight guy the actor really is. I’ve lived in the Midwest for most of my life. There are many gay guys who can’t dance and a number of them dance clumsily like many a straight man. Cute clip but I can’t figure out where in the movie it would be placed – – his friends don’t make up with him until after the play, on the way to the Ferris wheel – – so when would they squeeze in a trip to a gay bar? Saw this movie last night and snooze fest, the pretty little white boy with the perfect family and friends, it was nauseating, I found the character of the out african american kid with glasses story more compelling in just a few scenes he had and his back story. Sugar coated garbage. I saw it in the theater 3 times…. loved it. So refreshing and beautiful. Nick is so cute and a beautiful romance where no one dies. I love this deleted scene but I agree, hard to see where it would fit in the movie.